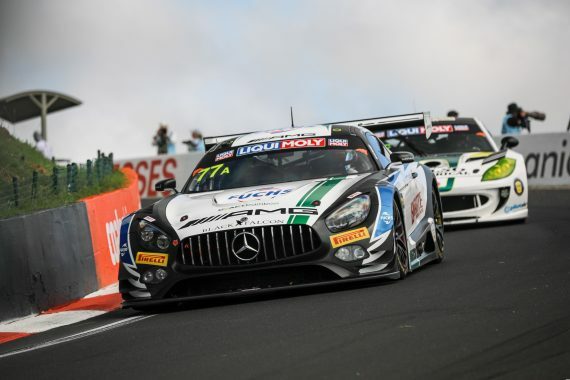 Gary Paffett made an instant impression on his debut at the 12 Hours of Bathurst as he ran as the leader for numerous parts of the race before technical issues brought an end to the #77 Black Falcon X Craft-Bamboo Racing Mercedes-AMG GT3’s 12-hour race. Heading into the weekend of racing, Gary recorded his first timed laps around the 3.861 mile Mount Panorama Circuit on Friday, in second practice, where the pace of the #77 Mercedes-AMG GT3 was clear to see as they finished the session in 4th place. Maro Engel was nominated for qualifying duties around the infamous circuit and posted the third quickest time in the Class A Qualifying, sending the team through to the all-important Top-Ten shootout. Engel once again impressed, posting the second fastest time in the shootout with a time of 2:03.0419, ensuring a front row start for Gary and the #77 Mercedes-AMG. Lining up in the scorching heat in the mountains of Australia, the team were ready for the challenge that stood in front of them. Luca Stolz opened the race for the team getting off to the perfect start as he passed the #999 Mercedes to lead the race. On lap 64 he came into the pit lane, from the lead of the race, and handed over the driving duties over to Gary. Gary continued to stretch the lead of the #77 car, before he made his first pit stop from the lead. Coming back out of the pits, the Fitbit-sponsored driver continued to improve the cars lead around the legendary circuit. Before making his second pit-stop, Paffett had stretched the lead to 15 seconds from #42 car of BMW. However, the DTM champion came to a halt on his 185th lap, slowing on the Mountain Straight before the #77 Mercedes-AMG GT3, unfortunately, shut down on the way down the hill with the Briton parking it up at Forrest Elbow. Despite not getting the result he and the team wanted, Gary was still pleased to make his debut at the legendary circuit in Australia. This entry was posted	on Wednesday, February 6th, 2019 at 9:00 am	and is filed under Featured, Motor Racing. You can follow any responses to this entry through the RSS 2.0 feed. Both comments and pings are currently closed.